Camber and toe are adjustable on the front suspension systems. Front camber is adjusted by moving the top of the strut and spring assembly. Rear camber is adjusted by means of eccentric cams on the rear upper arms. Caster is preset at the factory and should only be adjusted after all other possible sources have been inspected and corrected as necessary. Front toe is adjusted by the use of the front wheel spindle tie rod (3280). Camber is the vertical tilt of the wheel (1007) when viewed from the front. Camber can be positive or negative and has a direct effect on tire wear. 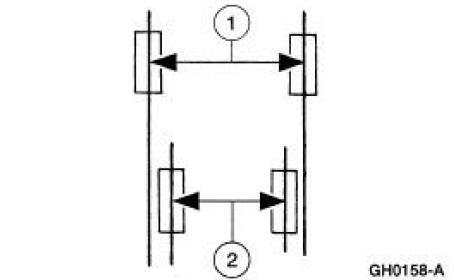 Caster is the deviation from vertical of an imaginary line drawn through the ball joints when viewed from the side. Caster specifications in this section will give the vehicle the best directional stability characteristics when loaded and driven. Caster setting is not related to tire wear. The vehicle toe setting affects tire wear and directional stability. Dogtracking or thrust angle is the condition in which the rear axle is not square to the chassis. Heavily crowned roads can give the illusion of dogtracking. Wander is the tendency of the vehicle to require frequent, random left and right steering wheel (3600) corrections to maintain a straight path down a level road. Shimmy, as observed by the driver, is large, consistent, rotational oscillations of the steering wheel resulting from large, side-to-side (lateral) tire/wheel movements. Shimmy is usually experienced near 64 km/h (40 mph), and can begin or be amplified when the tire contacts pot holes or irregularities in the road surface. Sometimes confused with shimmy, nibble is a condition resulting from tire interaction with various road surfaces and observed by the driver as small rotational oscillations of the steering wheel. Poor returnability and sticky steering is used to describe the poor return of the steering wheel to center after a turn or steering correction is completed. Pull is a tugging sensation, felt in the steering wheel, that must be overcome to keep the vehicle going straight. Drift describes what a vehicle with this condition does with hands off the steering wheel. Drift/pull may be induced by conditions external to the vehicle (i.e., wind, road camber). Poor groove feel is characterized by little or no buildup of turning effort felt in the steering wheel as the wheel is rocked slowly left and right within very small turns around center or straight-ahead (under 20 degrees of steering wheel turn). Efforts may be said to be "flat on center." Under 20 degrees of turn, most of the turning effort that builds up comes from the mesh of gear teeth in the steering gear (3504). In this range, the steering wheel is not yet turned enough to feel the effort from the self-aligning forces at the road wheel or tire patch. In the diagnosis of a handling problem, it is important to understand the difference between wander and poor groove feel.